The weather’s warmed up here. Well, actually, that’s the understatement of the season. Speaking of ‘seasons’, apparently someone didn’t get the memo that Spring follows Winter and gave the go-ahead to jump straight on into Summer. Not cool, dude. Not cool. Especially if you or your kids have allergies. It will wreak havoc on your sinuses. I mean oaks that don’t normally bloom until June/July here are in full swing… in April. I’m almost afraid to see what this Summer has in store. If there’s one thing I do know though, it’s how to cool off on a hot afternoon. A big old bowl and my favorite indulgent ice cream. Cold and creamy, every spoonful is so satisfying. Don’t believe me? Try it, and tell if all your heat induced worries haven’t disappeared. Ice cream, it’s a magical cure all for so many of life’s inconveniences. Every year I look forward to the new flavors that Blue Bunny® will be introducing to their line up. Judgement free zone here, friends. Judgement-FREE. Seriously though, once you sample their ice cream, you will instantly understand. It’s the best, spoons down. Or up, and dug right into the carton. 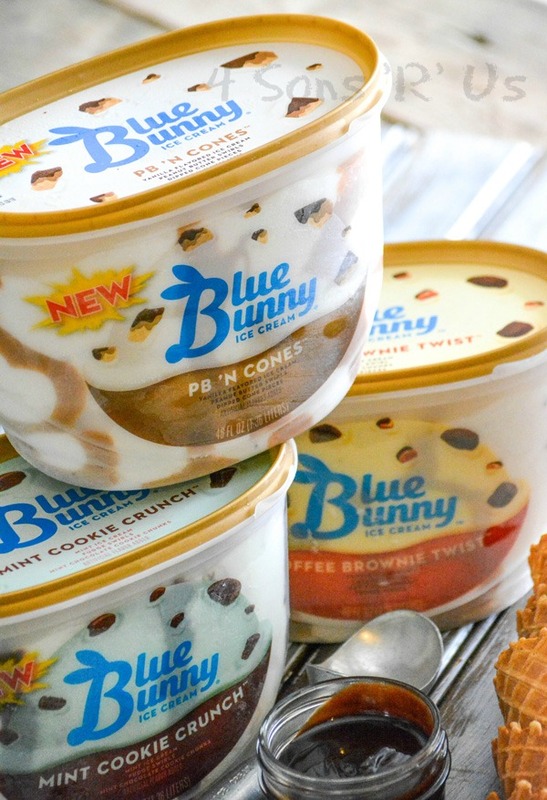 For over 80 years, Blue Bunny® has been churning out yummy ice cream made with fun, fresh ingredients. It’s the perfect way to insert a little playfulness into any occasion. And will have the whole family running to the table. My favorites this year included: PB ‘N Cones™, Monster Cookie Mash, Toffee Brownie Twist™ and Mint Cookie Crunch. How good do those sound??? I grabbed three. I mean, I can’t wait to try them ALL– but I’m not tempting fate with more ice cream than that on hand in my freezer. I’m only human folks. And so are the sons and husband. Having ice cream on hand is just the thing to add a little bit of yum to any day. Especially a rainy day, or in our case a rainy week. It’s the perfect little pick me up to an otherwise gloomy forecast. And with these amazing new flavors that have been rolled out for 2017, it’s impossible not to be excited. The PB ‘N Cones™ had me drooling the whole way home. I could literally SEE the swirls of creamy peanut butter and crunchy chocolate dipped cone pieces studded throughout their yummy vanilla ice cream. Normally, I’d opt for a bowl or a cone to scoop it into and enjoy. But something this special, demanded an equally epic introduction to my guys. Even I was a bit surprised by how easy it was (and let’s be honest– awesome) to move beyond the traditional bowl/cone pairing. Instead, I served them up on a bed of epic deliciousness– a fluffy waffle taco. 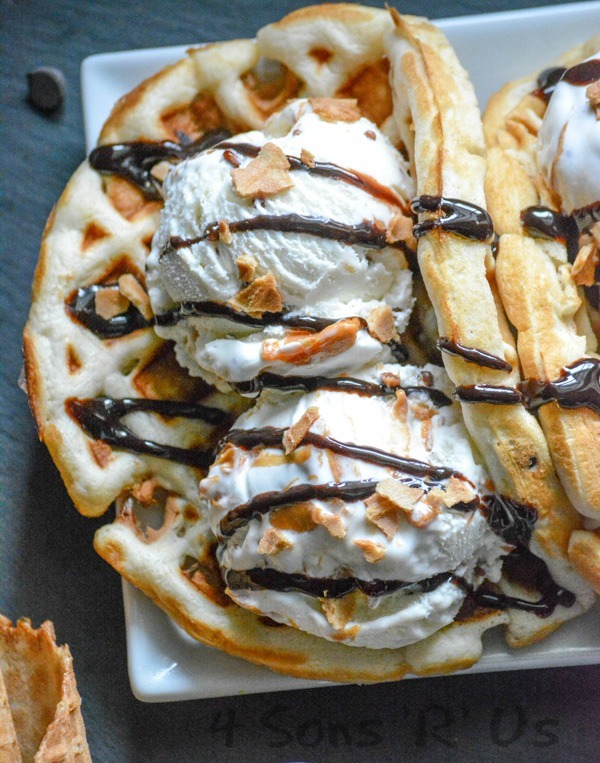 The PB Ice Cream Waffle Taco is the thing you never knew you wanted, that you now won’t be able to live without. All courtesy of Blue Bunny®’s latest creative ice cream flavor- yup, you guessed it, PB ‘N Cones™. It’s gonna be the next big thing to take over the dessert world. A lightly fried chocolate chip waffle is folded in half to resemble a taco. 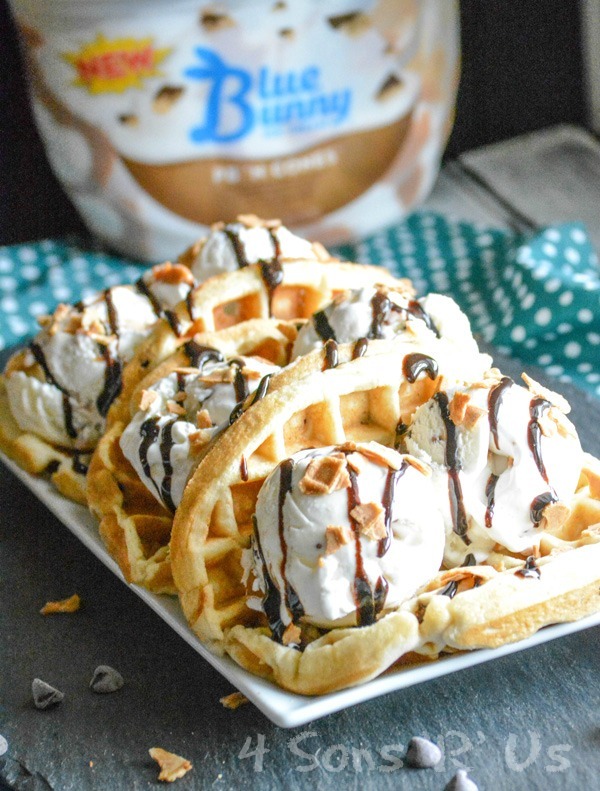 Stuffed with several generous scoops of luscious PB ‘N Cones™ ice cream, topped with a thick drizzle of chocolate sauce and a sprinkle of crushed waffle ice cream cones. 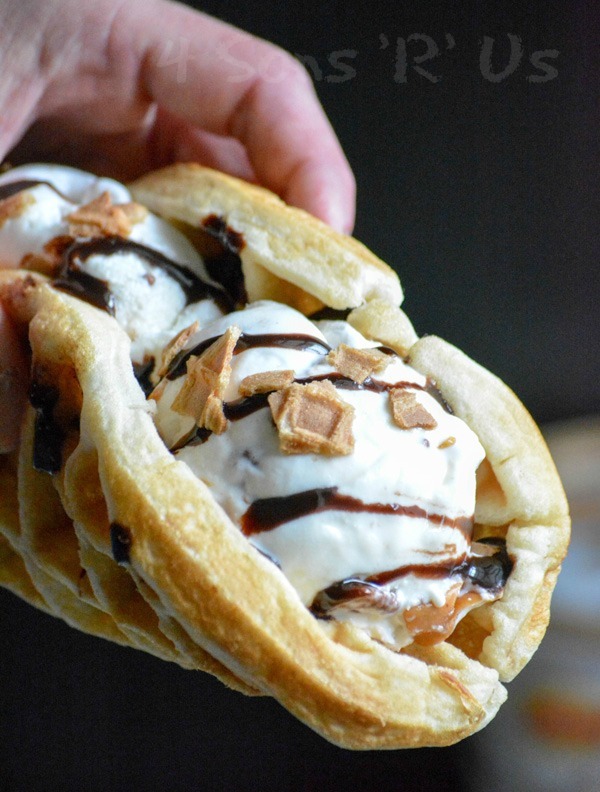 You need this PB Ice Cream Waffle Taco in your life. 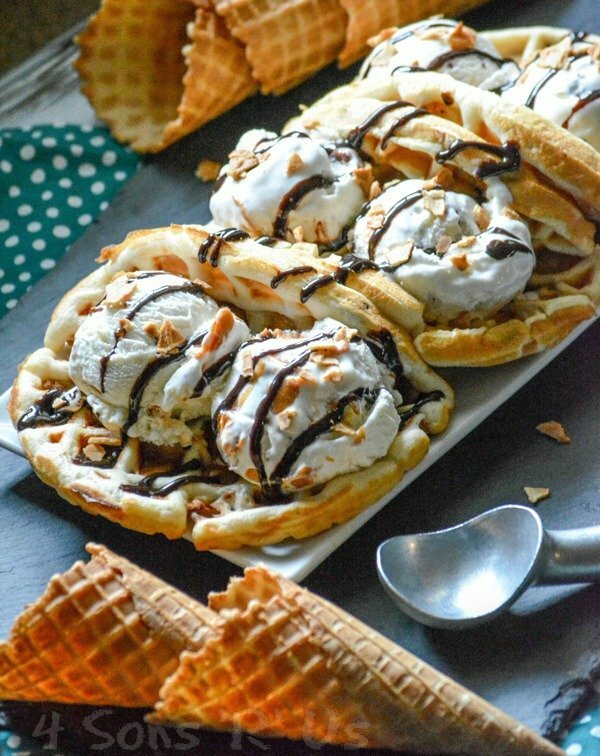 An epic ice cream dessert that adds a bit of fun into any evening, especially when shared with someone special. Carefully add the cookie mix into the shake n pour container. Pour in the water, seal, and shake-- mixing until the batter's completely incorporated. Add in the chocolate chips, shaking again to evenly disperse. Preheat a round waffle iron. When ready, spray the iron with the non stick cooking spray. Pour just enough batter onto the iron so that it spreads out in a complete, thin layer. Add more water to the batter if necessary so it spreads. Cook the waffles, according to the iron's directions, until they're cooked through and golden brown. Carefully remove the cooked waffle and transfer to a cooling rack. As soon as the waffle's cool enough to handle, place the handle of a wooden spoon in the middle. Carefully fold the waffle in half, over the spoon, creating a taco shell shape. Let it cool completely before removing spoon. Repeat for all waffles. Fill each waffle taco shell with generous scoops of the PB 'N Cones™ ice cream. Three small scoops, or two large, fit across perfectly. 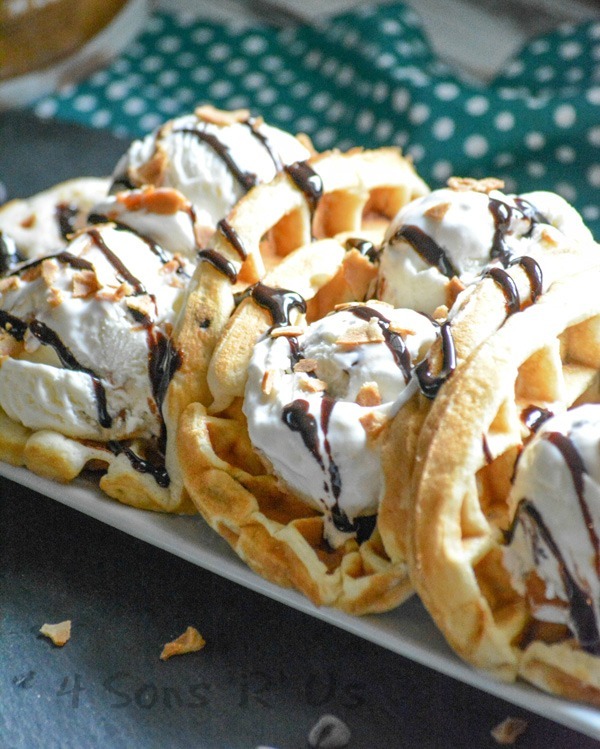 Plate the stuffed waffles and pop them into the freezer for 3 minutes, just long enough to firm up the ice cream. 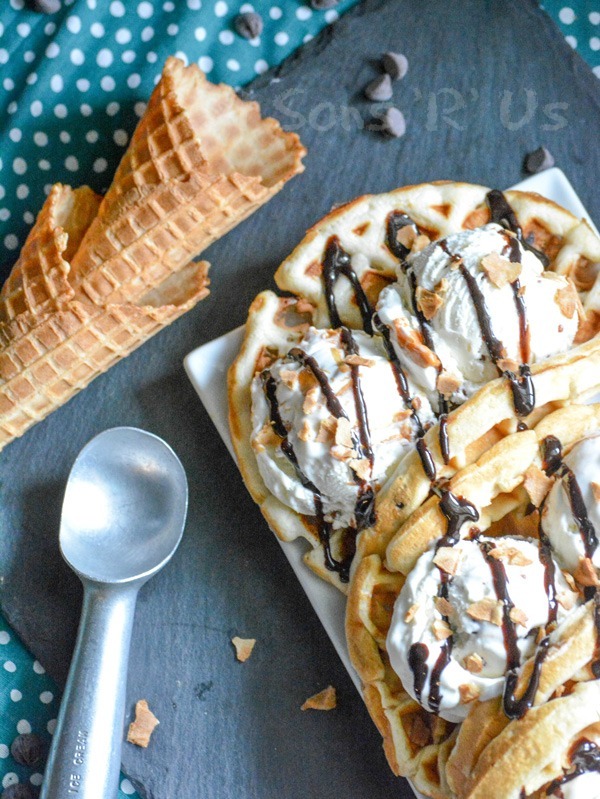 Serve the waffles topped with chocolate drizzled overtop and sprinkled with crushed waffle cone bits. 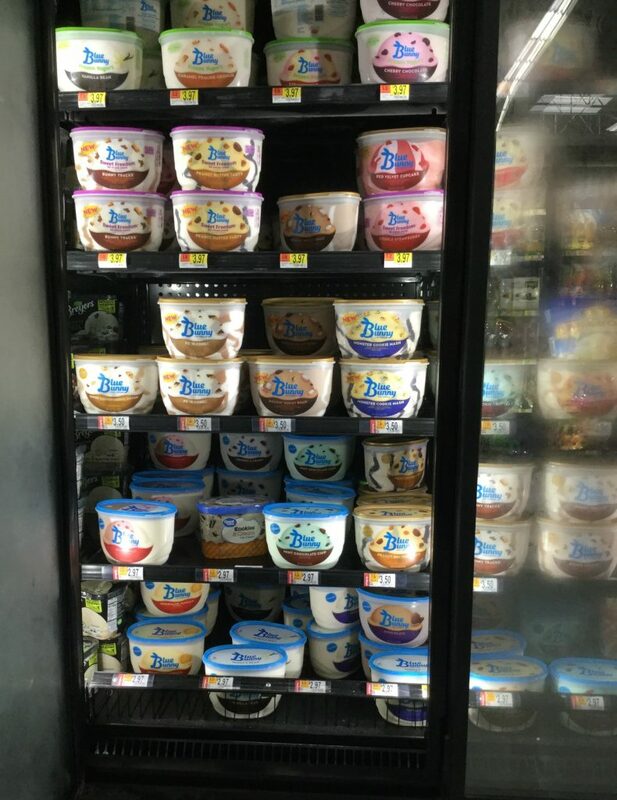 Run, don’t walk, to the freezer section of your nearest Walmart and grab a tub, or two, three, etc, and get in on this yummy action. Regardless of the weather outside, it’s going to be a cool evening with this refreshing dessert. We can’t wait to hear which flavor’s your favorite. These waffle tacos are brilliant! Thanks, Ashley! I happen to agree with you there. That is a picture perfect dessert. Great presentation! I’ve always loved ice cream sandwiches – the ones wrapped with bread/bun. Waffles sound pretty, too! Oh, I want these now!! Thank you for sharing at Fiesta Friday party! I hope you enjoy the food and the crowd! Happy weekend!